CIS 471: Massive, open, online classes -- presentation scales, does interaction? Massive, open, online classes -- presentation scales, does interaction? Coursera has added 17 universtities to their list of collaborators, bringing the total to 33. They have reached over 1.3 million students in 195 countries and raised raised $22 million in venture capital and received $3.7 million in equity investments from Caltech and Penn. 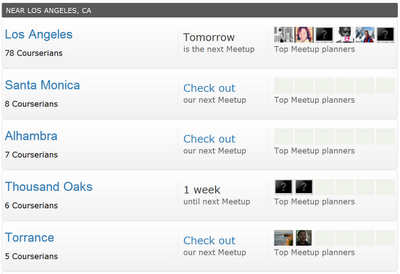 Not a bad start for a company that was founded last fall and funded in April. But, many, including me, have wondered whether it is possible to capture the peer-reinforcement and contact of a classroom online. Coursera (and others) hypothesize that students can communicate with each other online -- if there are 10,000 people in a course, someone in some time zone is going to be working on the same lesson at the same time as you. Students have taken interaction a step further, with course-specific groups meeting face to face. As of this morning, 7,839 Coursera students had formed 1,119 communities on Meetup.com in 1,014 cities and 2,824 Udacity students had formed 478 communities in 453 cities. I live in Los Angeles, so checked to see what was happening around here. It turned out that there are 78 registered Courserians in Los Angeles and smaller numbers in the many cities making up the metropolitan area. 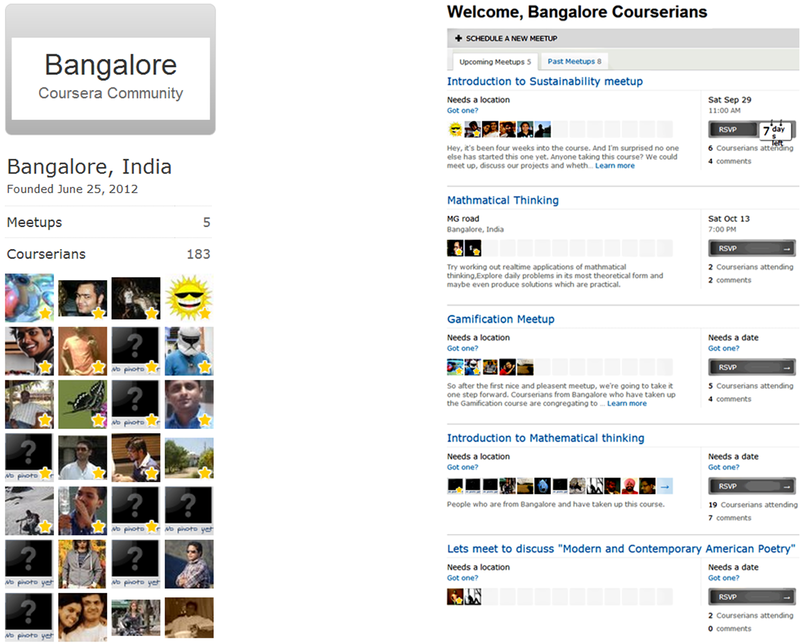 The three largest Coursera community cities are Stanford with 979 members, New York with 241 and San Francisco with 213. But the most interesting to me are the next three -- Bangalore with 183 members, London with 172 and Moscow with 144. This reminds us that online education is a global phenomena. Courses are being offered in many nations and students from many nations are taking them. In Version 1 of the book, Gutenberg pruduced copies of hand written bibles. In Version 1 of the motion picture, we put cameras in front of stage plays. Version 1 of radio featured oral drama. Version 1 of television resembled vaudeville and stage skits. Etc. Version 1 of the online course was to teach the same class from the same textbook using the same PowerPoint slides and videos that come with the textbook, substituting email and threaded discussion for face to face meetings in a classroom. The results have been OK, but not spectacular. 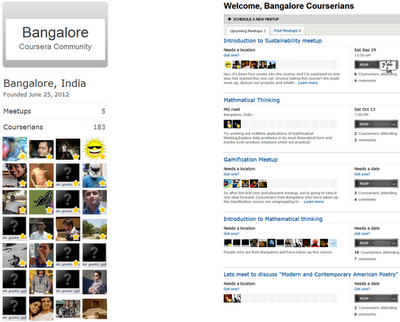 Coursera and many others are experimenting with Version 2. They have massive scale in their favor, and perhaps student-organized meetups and online groups for peer grading and feedback will enable them to scale interaction as well as presentation. Coursera has raised an additional $43-million. Investors must have confidence in their ability to eventually make money. For more on this investment in Coursera and their plans, see this article.